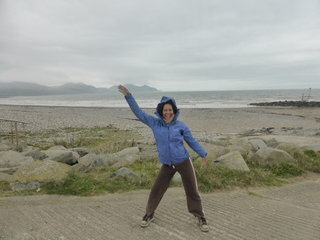 So Jane and I decided to go for a walk along the beach yesterday and nearly got blown away. 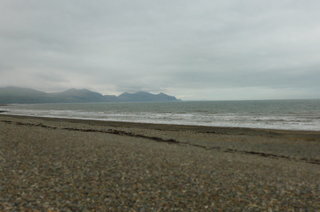 Spring hasn’t quite arrived in North Wales! I know this may sound like a winter time treat, but having just returned from India, Wales seems pretty damn wintery to me! Jane and I are warming our cockles around steaming mugs of hot ginger drinks (I have managed to pick up the dreaded sniffles). 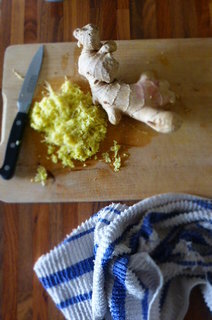 Ginger is the best thing for colds et al, more like a potion than just a refreshing tipple. This cordial also work brilliantly cold, over ice and in a tall glass (glug of gin optional). The B.H.K is a global thang and we know that many of you are getting ready for winter. This zingy cordial will help to ease the blow of dark days and timid sun. We know that our mates Fran and Steve down in Tasmania will dig it for example. Serendipity Farm will be buzzing! We love making our own stuff, you know what goes into it. Most cordials, even if they are organic and well made, are packed full of sugar. Here, you can use as much or as little sweetener as you like. Sometimes we have it neat, sugarless. A real wake up zing in the morning! Try this with hot apple juice for an even more decadent steaming cup of joy. This is one of those things, once you make one batch or cordial, you cannot stop. Roll on the elderflower season. Coming soon hopefully……..
Glorious grated ginger – can you smell that zing!!!! Sweetener – as you like, we go sugar free is poss. Place all (except the lemon juice) in a medium saucepan and bring to a boil, pop a lid on and simmer for 20 minutes. Set aside, squeeze in the lemon juice and leave to steep for 2 hours. The longer you leave, the more punch the cordial will have. We find that after a night in the fridge, the flavours are even more full power. You may like to add your sweetener now, but we prefer to do it when we drink it, depending how our sweet tooth is feeling. Strain into a jug and pour into a clean glass bottle or a kilner jar. Something sealable and preferably glass. Because it is lacking in loads of sugar, this won’t last for as long as other cordials. Keep in the fridge and use between 3-5 days. Trust me, it won’t hang around that long! Sweeten as you like, with what you like. We use brown rice syrup or sometimes stevia if we are being supremely healthy. Liquid sweeteners work best as they dissolve quickly and easily. Hot off the hob – try it warm or cold with great apple juice. YUMMMAH! All the spices in this cordial are AMAZING for the body! They are natural medicines for all sorts of ailments. We will focus on star anise. Boil star anise in some water and sip it gently, it will soothe stomach pain and cold/ coughs. Add cinnamon, coriander seeds and fennel seeds to the pan and you will be cured in double quick time. 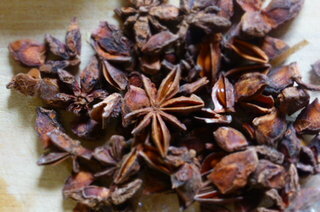 Anise has a delicate liqourice flavour and the seeds of the star are simply anise seeds. Surprisingly! The seeds and the husk can be used in cooking, baking etc. The main source of anti-oxidant glory is the volatile (in a good way) oil named anethole, but anise does boast a potent cocktail of other anti-oxidant oils. In many traditional medicines anise is used for: anti-flatulence, anti-spasmodic, digestive, anti-septic, expectorant, stimulant and tonic. They are also a wonderful source of the vitamin B’s, vitamin C and A and contains high levels of iron, copper (good for red blood cells), calcium and potassium. It sounds strange consuming all these minerals, but potassium, for example, really helps to lower blood pressure and control heart rate. What magnificent and fascinating bodies we inhabit! Have you guys ever considered making your page Pinterest friendly? Its a great way to spread the love. I would love to pin your gorgeous recipes but for some reason, I get the same images post after post.